The golf club is 45 years old, large, with attached hotel and golf tutoring. Situated in a comfortable and well-established quiet residential part of the Costa del Sol just East of Marbella. The golf course is surrounded by fairly upmarket small villas and good-sized apartments, none of which really intrude on the course. I thought the service in the clubhouse very good, both for the golf and food/drink, although the simple food I had there was a bit tasteless. The parking area is relatively small, and might be inadequate on busy days. Rio Real is basically a parkland golf course, although not completely flat. Half the holes have moderate slope. A few holes only have elevation tee-to-green of more than 10 meters. This is quite a long course, but plays quite easily. In other words, the official difficulty of this course is more related to length than inherent toughness of the golf holes. Still flat enough to walk quite easily. The outstanding feature of this course to me is the excellence of the grass. Very fine. By that I mean small-bladed and soft with no resistance to grab your golf club. Very easy to strike down though the ball and take the divot you want. This is not just on the fairways – it extends to first-cut (just off the fairway) and even further out. I looked hard all over the grassed areas for lower quality grass and struggled to find any at all. This is about as good as grass gets. You are basically playing off what looks and behaves like a high-quality lawn. As a very mature golf course, fairways are lined by large trees – mostly pines. There is a large and deep canalised stream (the Rio Real or in English = Royal River) that runs through the course. This is in play alongside 7 of the holes. A ball in that canal is gone – there is no way to get down to the bottom of the stream to look for it. The course runs down towards the sea (passing underneath the A7 road). The actual sea frontage is small - hole number 4 heads down towards the beach then hole number 5 heads straight back inland. The whole course is in a relatively small area, with holes tracking in parallel. Holes 15-18 in particular are a bit dull – some long, but very flat and repeatedly back-and-forwards. Not unusual for your typical parkland course which tends to have fairways quite close to each other. The few doglegs on this course are fairly gentle and the medium-width fairways mean there is always a sensible line of play in preference to a tiger line trying to cut the corner. There are large wooden hole maps on every tee, and the scorecard also has an accurate course layout on the back. So you always really know what direction you want to hit the ball. The bunkers here are good. No significant lip around the edges, good sand, quite large, bowl-shaped rather than flat. The bunkers on some holes are quite aggressive e.g. situated very close to the edge of the green. So definitely in play for even the best golfers. Not difficult to get out of, but located around the course in such a way that it is unlikely you will go round without landing in at least a few bunkers. 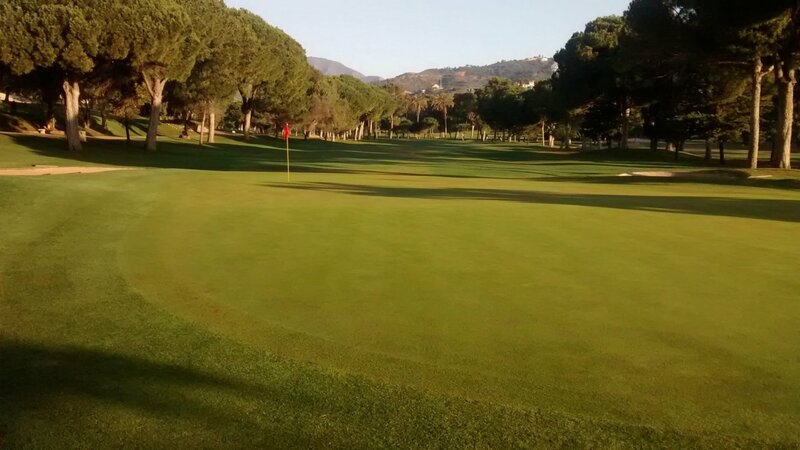 The greens are medium-sized, medium-fast, nicely grassed and and not much sloped. Getting down in 2 putts from anywhere on any green is definitely a target. Nothing about the greens is particularly tough, and getting up-and-down from a green-side bunker is not really hard either. As a mid-handicap player, I think Rio Real is quite easy, as long as you avoid ending up in the canal or among the large trees that line fairways. Definitely a nice golf course for a player at my level to play go-for-it drives off the tee and easy to play fairway irons off the soft grass. So where does the length of this course come into play ? The 10 par 4 holes average 350 meters so are a nice challenge. Even for a good golfer these are a strong drive and a non-trivial 2nd shot to the green. For a high-handicap player, the sheer length of the par 4s and par 5s on this course might be a bit much. Basically if you struggle to hit any ball more than 150 meters, you might find this course too much of a heave. But if you can hit the ball reasonably long and quite straight, this course holds no terrors. Again, this is what you can expect from your typical parkland course. This I suspect is what some people see as an idyllic golf course. Very lush, green, soft. 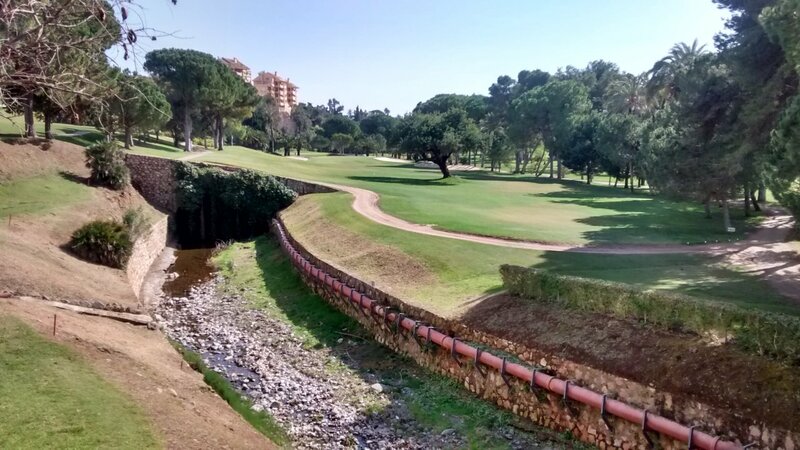 Apart from the canalised stream, no killer hazards along the way up to the green – and once you are close to the green things are not very demanding either. In some ways this is the sort of meandering parkland golf course you can find anywhere in the world. It is entirely different from the more typically Spanish golf courses you find further up in the hills – which are more spacious, austere and have genuine scrubby Mediterranean rough, oak and olive trees etc. Perhaps Rio Real attracts a certain type of lifestyle golfer who wants what they think is a 'typical' golf course. These are not necessarily good players – take up the game late in life, wear pastel-coloured chequered golf kit, take 5 hours to walk the course and never break 100. For that sort of player, this course is perfect. I mean that as a minority of course – I am sure Rio Real as a fine course has equally fine golfers. So do I recommend Rio Real ? Yes, absolutely. I think it is very good value-for-money, although perhaps in peak season the prices might jump up to the level that the quality of the course reasonably deserves. This is an excellent course to work on and improve all aspects of your game. Personally I find it a bit bland, but then I am used to playing the wide range of courses down here on the Costa del Sol. 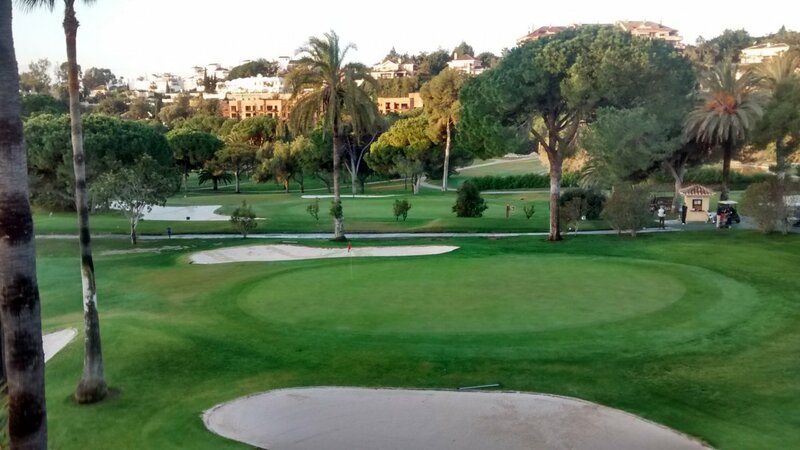 Still recommended, but if you like choice and have time you really should visit other courses on the Costa del Sol to see how other Spanish courses are distinctive by design. Rio Real is represented by the yellow dot. This shows the course is 'top 10' on length compared to all other courses on the Costa del Sol, and just outside top 10 when it comes to difficulty. An 18-handicap player can expect to go around this course between 20 and 21 over par.